As a cyclist, I do my best to avoid Vermont Ave. like the plague. 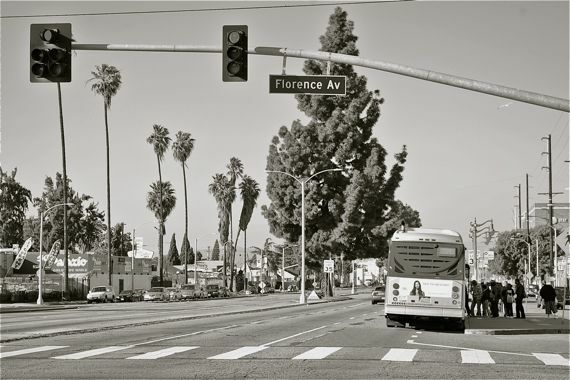 It’s always busy, it’s an important bus corridor, and much of it is in lousy, bone-rattling condition, especially in South L.A. Moreover, there are few spots where you feel like you have a comfortable cushion between you and drivers in a hurry that hate being on Vermont as much as you do. There might only be two blocks between Exposition Blvd. and MLK, for example, but that stretch is so narrow that it feels like you are running a gauntlet. And, much to the ire of drivers at rush hour, a cyclist has to take the full lane because because of the deep potholes on the southbound side and impressive array of asphalt moguls that run along the gutter on both sides for that whole stretch. South of Gage, where the road widens to three lanes and a separated business lane, speeds pick up just as the conditions worsen for everyone. During the day, a cyclist can generally manage to avoid potholes, cracks, and random palm frond debris while dodging cars. Things get dicier at night, however, when it is harder to see the depth of the cracks or the height of the moguls and you are more likely to be unexpectedly thrown off balance, possibly into traffic. Yet, because I’m usually running late, every Wednesday evening at rush hour, I find myself reluctantly sprinting the 140 or so blocks of Vermont that comprise the shortest distance between my apartment and the YMCA at Century Blvd., where I help mentor South L.A. youth from the Youth Action Council. Obviously, I haven’t died yet and am still in once piece, so I’ve managed to get there safely. But, of all the routes I do bike, it is probably the one where my mortality is front and center in my mind for most of the ride. Not being one who is particularly good at keeping up with bike-lane implementation schedules, the construction of new lanes along Vermont caught me by surprise a few weeks ago. I couldn’t decide if it was a good surprise or a bad one. I would NEVER say no to a bike lane, of course. They legitimize cyclists’ presence in the streets and make it clear to drivers that there is space for everyone. But, it was also a bit like unexpectedly finding that last hard-boiled Easter egg hidden behind a curtain several weeks after Easter: you’re thrilled to see it, but you may not want to eat it. The new lanes stretch the approximately 17 blocks between Gage and 79th. They are helpful, as stated above, in the sense that they make clear that there is ample space for both cyclists and drivers. I can attest that I definitely felt more relaxed riding within the space demarcated for my benefit and more vulnerable when lane-less. But, I am an experienced cyclist with 20 years of riding in seriously formidable traffic conditions under my belt. I’m not sure that unprotected lanes in abysmal condition will offer much of an incentive to novice riders, experienced riders who tend to opt for sidewalks or the quieter (but also abysmally paved) business lanes, or recreational cyclists, especially those that want to ride with their families. I haven’t seen anyone else chomping at the bit to test the lanes out, either, unfortunately. But it is easy to guess why. 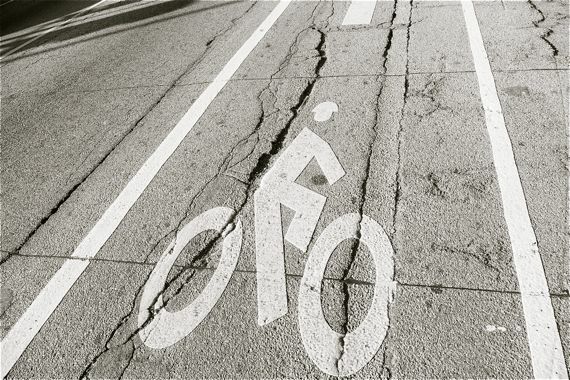 For one, dodging the potholes and wheel-grabbing cracks that liberally populate the narrow bike lanes requires both concentration and strong nerves, as you must sometimes edge toward fast moving traffic or mogul-infested curbs to avoid them. Every other block also seems to have a bus stop, which means that you are often playing leapfrog with buses. I have to give L.A. bus drivers credit — they have a tough job and many do their best to co-exist as amicably as possible with the cyclists they must share curbside space with. But, having to constantly swing out into traffic around stopped buses could be incredibly daunting for novice cyclists or someone with a child in tow. And, finally, there are the weird dead spaces where the dividers between the main lanes and the business lane disappear and you feel uncomfortably exposed in a sea of pock-marked asphalt. Attempts to provide painted guidance (see below) do mitigate some of the feelings of abandonment and vulnerability one might experience in those zones, but I can’t help but think we have evolved to be more creative with design than this. Even sections of Vermont where bike lanes were put in last year (at least, on the northbound side; some of the county-controlled southbound side has sharrows) between the Green Line station and 88th are in bad enough condition to serve as a possible deterrent to those that considered multi-modaling their way around the area. Although, I did unexpectedly see a horse using the bike lane at the intersection with 98th one night, so at least someone is getting some use out of it. As I said before, I would never say no to a bike lane. They are desperately needed along key corridors like Vermont and I am grateful they are there, imperfect as they may be. At the same time, they aren’t much good if they seem more hazardous than safe to a cyclist. Cracks, holes, and buses aside, I can see no reason why a cyclist would risk riding with fast-moving traffic when they can ride in what is essentially a protected lane (the business lane) for much of their commute in the area south of Gage. In a way, Vermont is a huge blank canvas: as many as eight total lanes south of Gage; center dividers that are sparsely decorated with trees and sad patches of grass; treeless islands that serve as bus stops but which are only sometimes ADA compliant and provide little in the way of shelter for those waiting for buses. Private ownership of the numerous vacant lots may hinder redevelopment of some aspects of the corridor, but the street itself is something we have control over. Repaved, reimagined, and restructured, it could be a much healthier and more pleasant corridor for everyone and a catalyst for growth a struggling community. 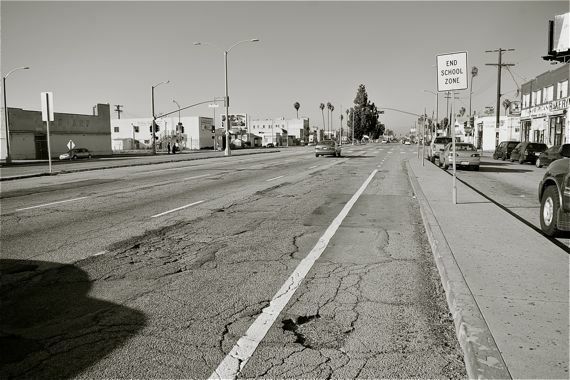 It is listed as a priority street in the South L.A. Community Plan, and sections of it (like the Vermont/Manchester area) are singled out for the focus of redevelopment efforts, but it isn’t clear yet what that means for the future of the length of the corridor. Dedicated Bicycle Lane w/Bus Lane (3.5 TDH may be modified to have a curb-adjacent bicycle lane with passenger crossing markings and boarding platform). Two Stage [Left] Turn Queue Boxes (NACTO). All of these are only possibilities at the moment. Vermont is only a candidate street for enhancements — nothing is set in stone. So, if some of these possibilities sound good to you, please check out LA/2B‘s website and vote for the implementation of enhancements in this and other areas of the city. The survey itself is a bit unwieldy, as you must vote on streets you may not know much about and it helps a lot if you know something about the 2010 Bike Plan. That said, it does allow for you to comment on the specifics of the streets where you would like to see changes, which may be the most beneficial source of information for planners. So, please, check it out and leave your comments in favor of a better bike corridor there. You’ve got 30 days left to add your two cents. Have you ridden the new lanes yet? Or have reasons why you prefer not to? Share your thoughts below. *Thanks also to Dennis Hindman for reminding me to check LA/2B’s updates regarding Vermont Ave. Personally, I think it is insane to bike on Vermont. I would never do it. It IS pretty insane. The more I do it, the more I feel like I understand the patterns better and know how to time the rides. But one of the youth I worked with asked about riding with me to the Youth Action Council meetings and it dawned on me that I would have to be smoking some serious crack to even think about guiding her down Vermont. I’d rather take her down Hoover, even though the lanes aren’t there. Historical note: Up until the 1950s the middle of Vermont Ave. had a double track streetcar line running to 116th St. The segment running north from Vernon lasted until 1963 (50 years ago this month). At 60th, the cyclists would be directed north using residential streets that run parallel to Vermont Ave. The more traffic and greater speed of vehicles should require that the cyclist is separated and barrier protection provided to guard them against motor vehicles. Instead, Los Angeles uses the cheapest methods for bicycle infrastructure on busy arterial streets, namely sharrows and stripping. The current goal of the bike plan implementation is more about quantity than quality of bicycle infrastructure. you’re right… i had forgot to check LA2B’s updates. none of those are set in stone, but they do offer possibilities for potential improvements. i’ll add that to the story. thanks. Vermont is a great example of a highway road standard being applied to an urban street. It does nothing well. Cars still queue up a lights in “traffic” (hah!) and businesses and locals suffer from a loud and dangerous street that funnels all available dollars onto larger and larger streets outside of the area, further suppressing whatever market power locals have to keep a wider variety of businesses afloat. I once rode my cargo bike down Vermont into an industrial district on one hundred and something or other street to pick up a couple hundred pounds of tools. The ride there was bad enough, but on the way back up to LA I had people honking and giving me dirty looks in beat up work trucks wanting to go nearly 50 mph past me. It really sucked. 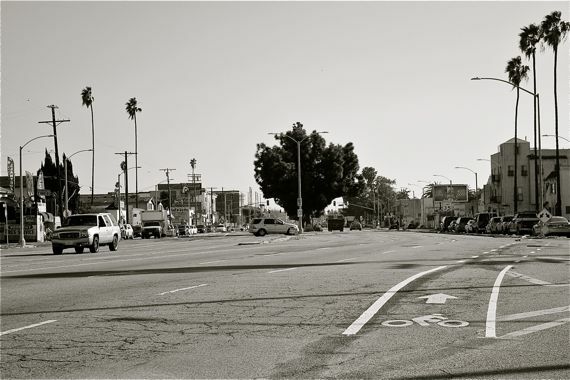 Bike lanes are nice but, like the lanes on Venice Blvd., the street needs to be designed with a higher goal in mind other than rapid automobile movement. If you want to get deep into south LA quickly – we have spent hundreds of millions (billions?) on the 110 freeway. Vermont and other streets should have the right of way that used to go to street cars be designated as additional car parking, bus only lanes, bike lanes, or more sidewalk. As Sahra notes, this stretch of Vermont is kind of’ a blank canvas. I’d also say it has “good bones”: a street geometry that could become something extraordinary. It shares this form with some of the most inviting large boulevards in the world, such as found in Paris. For example: http://www.ricksteves.com/tms/uploads/img/205ChampsElysees.jpg . The side roads (business lanes) separated from the main travel lanes by tree-planted medians provide wonderful buffering for cyclists, pedestrians, cafes, etc. This road layout was incorporated on Octavia Blvd. in San Francisco when the city completely rebuilt that road when a stub of the elevated central freeway was torn down a few years ago. See http://25.media.tumblr.com/tumblr_m7ff7i2j721raz9u3o1_1280.png . If the vitality latent in Vermont’s existing pattern is taken advantage of it could be incredibly revitalizing for a community that desperately needs it. Alas, planners are instead revising Vermont back into a conventional traffic conduit (yes, with enlarged sidewalks) by eliminating the side roads with new developments like the County Administrative building north of Manchester. Perhaps this was the community’s choice, but I think it is throwing away something really valuable and special. Portland has used the same traffic engineering tools to create a 6.3% bicycle commuting modal share that Los Angeles–with its 1% bicycle commuting modal share–is using for its bike plan. Stripping bike lanes on a busy street with fast moving traffic doesn’t attract much of the mass population to bicycle there, but it does quickly grab space for future improvements before traffic makes it increasingly difficult to wrangle any room for bicycle infrastructure. Portland has 319 miles of bike lanes/paths and bicycle boulevards (they call them neighborhood greenways). There are 4,700 miles of streets in Portland and 1,300 miles of those are arterial streets. The population of Portland is 593,820, which makes it one of the 70 largest cities in the U.S. According to the 2011 Census Bureau American Community Survey (ACS) Portland has a 6.3% bicycle commuting modal share. 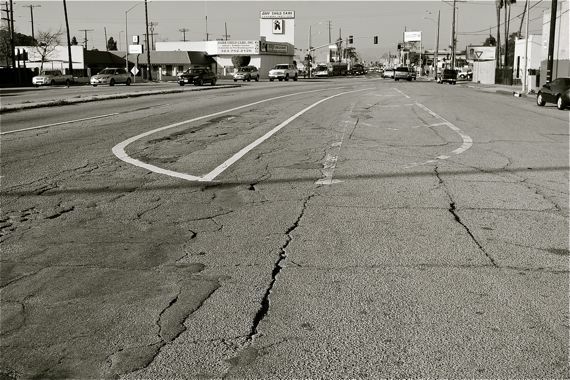 There are 6,500 miles of streets in Los Angeles and 1,400 miles of those are arterial streets. To match the proportion of bike lanes/paths/bicycle boulevards to total miles of streets that Portland has, LA would need 401 miles of them. At an average of 40 miles of bike lanes/paths/bicycle friendly projects installed per year, that would take two more years to achieve this. Page 442 of a report by professors Ralph Buehler and John Pucher shows that of the 90 largest cities in the U.S. an average 3.1% increase in bicycle commuting is associated with a 10% greater bike lanes supply per 10,000 population. The 2010 LA bike plan listed 167 miles of existing bike lanes and the 2010 ACS bicycle commuting modal share was .9%. A 10% greater supply of bicycle commuters is associated with a 32.258% increase in bike lanes according to the study. That would require 220 of bike lanes in Los Angles to create about a 1% bicycle commuting modal share (up from .9% in 2010). The 2011 ACS bicycle commuting modal share for LA in 2011 was at 1%. These results of this study also indicates that if LA has a typically average increase in bicycle commuting for the amount of bike lane miles installed per population, then it would require 274 miles of bike lanes to reach a 1.1% bicycle commuting modal share. Also according to this study, a 10% increase in the supply of bike paths per 10,000 population has an average 2.5% higher level of bicycle commuting. 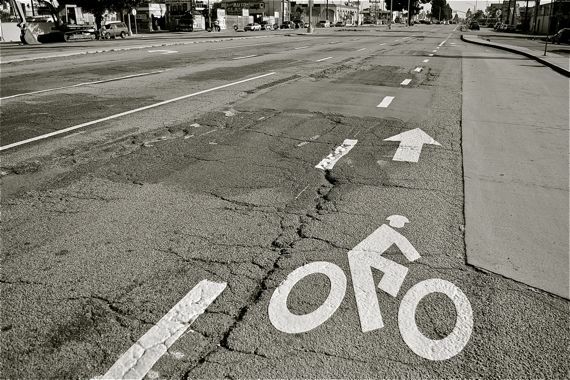 LA had about a 13% increase in bike paths since the 2010 bike plan. Using the average, these additional miles of bike path should produce a 3.25% increase in the bicycle commuting rate in LA. Excluding the rise in gas prices that occured in 2012, I would expect that the upcoming ACS bicycle commuting modal share results for LA will indicate at least a 1.1% modal share for 2012 if the bikeway installations produce what would be a average rate of increase per population for the 90 largest cities. Why does this post include pictures of pavement that were clearly taken in Baghdad? I live in Gardena & work in DT. I want to bike to work but when I see cars riding in the bike lane to overtake another vehicle I just cringe. It happens almost everyday on my commute & not one police officer that I have seem as of yet so much has stopped anyone from pulling that stunt. It seems police officers may think its not worth the time to protect & serve a bike lane. I agree and like the “good bones” assessment…I do really wish Vermont were going to be looked at as a whole. The piecemeal approach is disheartening when it could be an asset–a great green corridor. Riding 140 blocks up and down it as I do, you get such a taste of the diversity of the communities that comprise the city and the potential the street has to tie them all together. It really should serve as more of a showcase. It is one of the rare sites where we have all that streetspace already staked out. Why not convert it into something amazing? I agree! I ride on Vermont Ave. from Sunset to Jefferson, and it clearly has “good bones” for a bike lane, the whole way up and down the street. I wonder, could we start a campaign to make it happen? L.A. County implemented road diet bike lanes, visible from the Metro Blue Line.